Production photos courtesy of Dutch National Ballet © Angala Sterling. On a plateau in the mountains, a troupe of traveling actors has set up camp. Kitri and Basilio appear and ask the actors to help them escape. While the group performs, Kitri and Basilio put on costumes and join in. 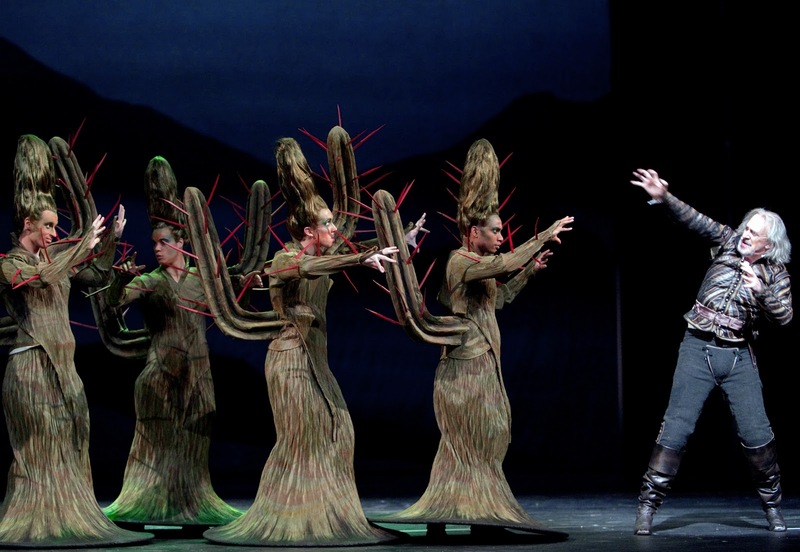 When Lorenzo and Gamache arrive at the camp, they are told Kitri and Basilio have left and are pointed in the opposite direction. Their departure is followed by the arrival of Don Quixote and Sancho Panza. The Don watches the performances and sees the characters in the play as real; however, he does not realize that Kitri is part of the performance. When he sees the princess is being beset by the devil, he destroys the whole camp. Everyone leaves except for a battered Don Quixote, attended to by Sancho Panza. The dazed Don thinks the windmills on the plateau are monsters and he sees Dulcinea in the moon. At night, Don Quixote is plagued by dreams. Gradually his nightmare turns into a heavenly vision. He dreams of seductive wood nymphs and charming cherubs. And the radiant central figure in all this bliss is his Dulcinea. As the Don has saved her and vanquished the monsters, the queen of the wood nymphs crowns him with a laurel wreath. Sancho Panza appears and tries to revive his master with wine. When the Don finally wakes up, Sancho Panza, Joanna, and Carasco take him back to his home.